Hey, you won my Oceanus Shenron! For DeAgostini, the first 30 were released 2 or 3 times. The second 30 (which includes the shenrons) were only released 1 time I think, so they are rarer. Depending on your luck, the first 30 are worth maybe $5 to $8 on average and the 2nd 30 maybe worth $10 to $40 depending on your luck, patience, and whether you are buying from somebody in the US or you are willing to speak Italian and pay crazzzzzzzzy international shipping charges from there. PGV is a good resource for them though. He's our only Italian member and who helped me complete my set. ToadKart, now she's mine ! Thanks man, I'll take good care of her! Usually depends on the character and the rarity and the desirability. 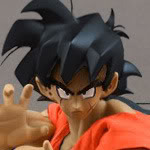 Ones that came out at the end of the line like Goku Jr. are hardest to find as are the French Atlas exclusive figures. @prodigy1367 I have Omega Shenron from that collection, only 50 were ever manufactured by DeAgostini! Luckily I have 4 out of the 7 Shadow Dragons so I just need to get Rage, Naturon, and Haze. Shame we never got to see a complete set of nicely sized Shadow Dragons outside of this set. Maybe Figuarts one day will do this with their new GT line, one can only hope! Well if im lucky enough i think i might find them for you, anyway i will post it here if i got any good news! Where did you get that information from? Way more than 50 were made by DeAgostini. They completed the whole set for mass market so theres more like thousands of those figures. Yeah Ghenny , I'm sorry but that information is completely innacuarate. I think Ghenny might have misunderstood some information online. DeAgostini made a GT series of figures, with 50 different figures in the entire set. They didn't only make 50 figures, though. The Omega Shenron is 1 of the 50 figures in the set, not literally 1/50 figures ever made. Maybe its true, but im also sure about this piece because i read somewhere else i dont remeber for the moment. Anyway guys, thanks for the info! There are definitely more than 50 of them, there should be thousands. I believe the way DeAgostini worked is they released 30 characters, they were popular, they released them again a few years later, added 20 figures, then later added 10 more. PGV would know if that's accurate or not. Omega Shenron is in that first 30 if I remember right, so there should be a lot of him, because he was released twice. Nope sorry your information is incorrect. If that were true then I've found about 4 of the 50 every produced without trying. Thousands of these were produced just going by what's been available on Ebay. Just letting people know that DeAgostini has now started releasing in the US under De Agostini USA. They are releasing a Millennium Falcon that's huge and you get a different piece each month to build it. Maybe Dragonball figures are next? Probably not, but it's nice to think about.